Due to the high rainfall and humidity in the region, many Raleigh gutters will often acquire stains from oxidization (essentially rusting). These oxidization stains make your formerly pristine clean gutters unsightly. The solution is gutter polishing in Raleigh. Our gutter polishing services in Raleigh will remove those unsightly stains from the exterior of your gutters. As this layer of oxidation on the exterior of your gutters is not organic growth, it takes a special cleaning solution and some good old fashioned elbow grease to remove. But don’t fret, because Premier Property Services can get your gutters looking new again! When we are performing other Raleigh power washing services or repair services for our clients, we often recommend that they get their gutters polished as well, and the response is often “What is gutter polishing?” The answer is actually deceptively simple. Gutters, as chutes for rain and other liquid from your roof, often become oxidized over time. This is especially true in habitually wet areas such as Raleigh and can lead to your home not looking as polished as it could otherwise, even with our top-quality exterior repair, roof cleaning, and low-pressure house washing services. It is often said that the devil is in the details, and no details are more noticeable than polished white gutters. Gutter polishing is the service that turns stained and ugly gutters back into the clean, white pieces they were upon your purchase. Since stains on your gutters are usually oxidization instead of algae, our gutter polishing in Raleigh involves both a special anti-rust cleaning solution and hard work. 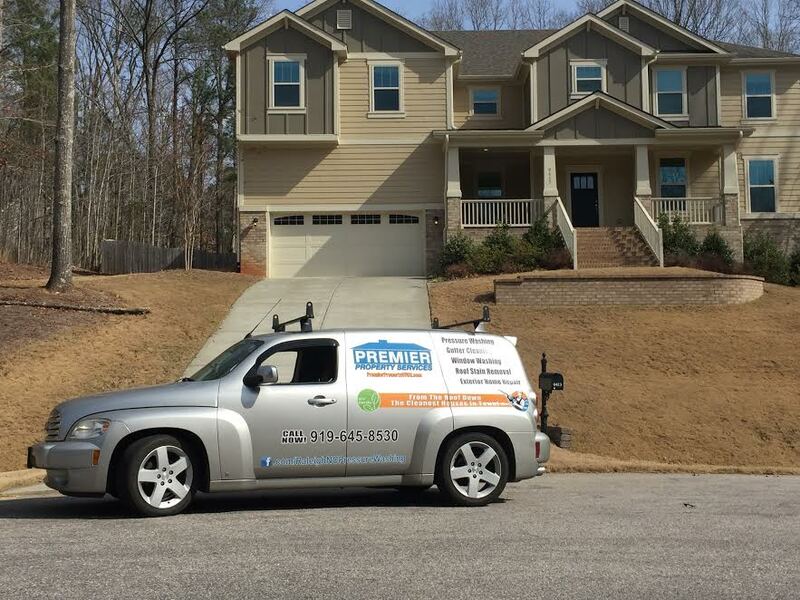 Whether your gutters are a dirty spot on your otherwise-clean home exterior, or if you entire home could use a good washing, make sure to contact Premier Property Services today. We have years of expertise in every facet of home exterior cleaning, from windows to concrete to decks to the aforementioned gutters. If you really want to wow roadside viewers, Combine this service with a low-pressure house wash, and watch your home shine! Call us today for a free consultation or contact us online and kiss those unsightly stains goodbye!